There's always a worry when syncing data with iTunes that you may lose music in the sync. Fear not, as Droid Transfer intelligently syncs your Android device with iTunes, allowing you to be in control of what data is transferred. Visit our TouchCopy page if you need to transfer music from iPhone to iTunes instead. Open the "Music" tab from the feature list. To transfer music to your Android, click the "Copy tracks to Android" button! 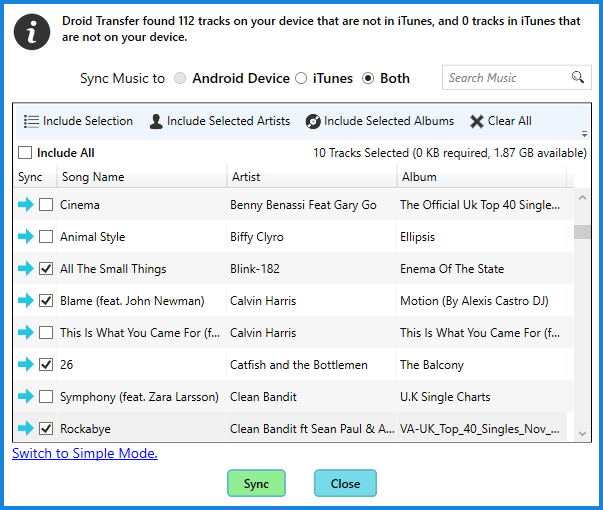 Droid Transfer makes it easy for you to copy music from iTunes to your Android device, and vice versa. You can sync your music without the fear of iTunes overwriting your music. Firstly, you'll need to connect your Android device to Droid Transfer on your PC. Then, click the "Music" feature header in Droid Transfer to display the music from your Android device. Click "Copy tracks to iTunes" to copy new music from Android to iTunes -or- Click "Copy tracks to Android" to copy new music from your iTunes library to your Android device. If you would like even more control on which music is transferred, Droid Transfer provides an Advanced Sync Mode. Activating this mode provides you with the ability to decide exactly which tracks to include in the sync. This pane also provides information about how much data is needed for the transfer, so you can predetermine whether your Android device has enough space before you try to transfer too many tracks! "Sync Music to..." - Choose whether the sync is to Android, iTunes, or both! "Search" - search for specific tracks, artists and albums. "Include All" - Checks or unchecks all tracks. "Clear All" - Unchecks all tracks. "Include Selection" - Checks all selected tracks in the list. You can select multiple tracks by ctrl-clicking them. "Include Selected Artists" - Click this after selecting a track to include all tracks by the selected artist. "Include Selected Albums" - Click this after selecting a track to include all tracks in a selected album.